Displays screens are becoming more popular in businesses as a method of engaging with visitors in many different corporate establishments. From office receptions through to hotel lobbies, museums or convention centres, these screens are a modern communication tool that offer a wide range of functionalities. Are you wanting to welcome visitors with something more impressive than your company logo and a sofa? Business display screens in the form of digital signage is the latest ‘must-have’ technology in reception areas, ideal for sharing branded company information as well as displaying local or national news. Eye-catching reception screens are a fantastic way of making a first impression to new customers, prospects or suppliers as the reception area is often a visitor’s first interaction with your brand, after your company website. • Advertise partner’s products to generate income. Using Sharp Signage software, your company logo, brand colours, a welcome message and company information can be scheduled to appear at different times of the day. This means you can create bespoke messages for each visitor to display when they are due to arrive for a meeting, adding that extra personal touch. Unlimited templates allow you to show as many messages on the screen as you want. The easy drag-and-drop software means anyone can manage the screen and create instant changes. 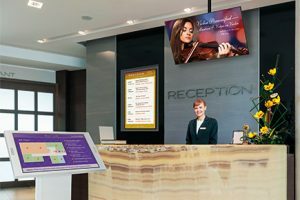 Hotels are beginning to use interactive reception screens to display dynamic content to guests as well as internal staff. From advertising local restaurants and theatre showings, through to excursions and car rental packages, these screens allow guests to quickly see what is going on, without needing to visit the concierge desk. These screens can also be touch-enabled, which can allow guests to interact with the information, and even make reservations via the screen. 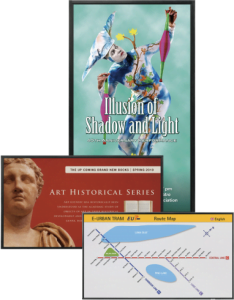 When you attend a conference or exhibition, you are usually greeted with multiple large posters or sign that tells you where to go. Rather than having to print the many posters, conferencing companies have begun to adopt digital signage which can have key messaging and directions on a rolling sequence. This is especially beneficial when a venue is hosting multiple events. As mentioned above with hotel screens, the addition of touch can enable delegates to interact with the screen to find exhibitors that they particularly wanted to see and even sign-up to seminars or demonstrations that are happening throughout the conference.